The History of Love turned out to be an epic read. It took me nearly half a year to finish the book and almost as long to work out why I had so much trouble engaging with it. The cover of my book had all sorts of labels attached to it '1. Shortlisted for the Orange Prize for Fiction 2006'. 2. A quote from Ali Smith "A beauty of a book, totally alive, made with real energy. It restores your faith in fiction. It restores all sorts of faith". 3. And another from the Independent on Sunday "A tender tribute to human valiance. Who could be unmoved by a cast of characters whose daily battles are etched on our mind in such diamond-cut prose?" I didn't not like the book, I just couldn't rave about it in such glowing terms. I kept waiting for the book to live up to the quotes...and it almost never did. At every page and stage I felt disappointment as I waited for "real energy" and "diamond-cut prose". 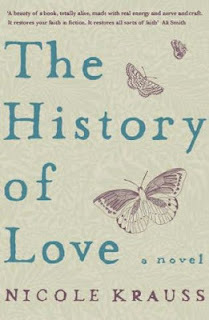 Sadly, The History of Love did not live up to my expectations. However Leo did stay with me the whole drawn-out time. Even as I read other books inbetween and forget about everyone else in the story; Leo stuck. His loneliness and loss struck a chord. Perhaps the book could have been called The History of Loneliness? Loneliness, loss and love go hand in hand. To love is to fear losing that love one day. You can't have one without the other. Certainly none of the characters in Krauss' book did! I'm including this post in Jenny Matlock's Alphabe-Thurs L meme. Good for you for sticking with it. I don't think I would have been so tenacious! mmm...to bad the book did not live up to its glowing accolades. I recently read a book that was well received. Certainly the prose was lovely. The story, based on an historical fact, was seemingly intriguing. But ultimately, I just didn't care deeply about the characters. If it hadn't been a book club book I might have given up on it. I have a hard time working through books that don't grab me! I also found this to be a difficult book and even so, went on to read two of her others, Man Walks Into A Room and Great House. I am not even sure why I stayed with her as I did, because these others were rather lacklustre for me, too. Great House..... basically about the travels of a certain desk [yes, desk]..... I'm sorry, but I just did not GET the book. You're not alone n finding History of Love to be somewhat unrealistically hyped.